Hubby and I absolutely love our summers here in the northwest! One of our favorite things about it is picking fresh fruit from the local farms around our area, and berry season is an extra-special treat. Unfortunately, due to vacation, company, and a generally busy schedule, we discovered that we had completely missed strawberry season! I am really disappointed because I like to freeze 10 lb. or so to have on hand for our Sunday night smoothies! We were also sad to find out when we arrived on the bluff that a poorly timed hail storm had ruined many of the season's cherries! We managed to find some good ones amidst the splitting and small fruit, but I'm sure it's a blow to the farmers! However, even in the bad news, there was a bright spot- raspberries! We spent an hour or so in 90+ degree weather to glean these beauties, but they were worth it! I think I had forgotten how much I enjoy a good raspberry. So, inspired by our bountiful supply of sweet and tangy berries, I decided to adapt Closet Cooking's recipe for a bright strawberry salad into a raspberry salad! It did not disappoint! 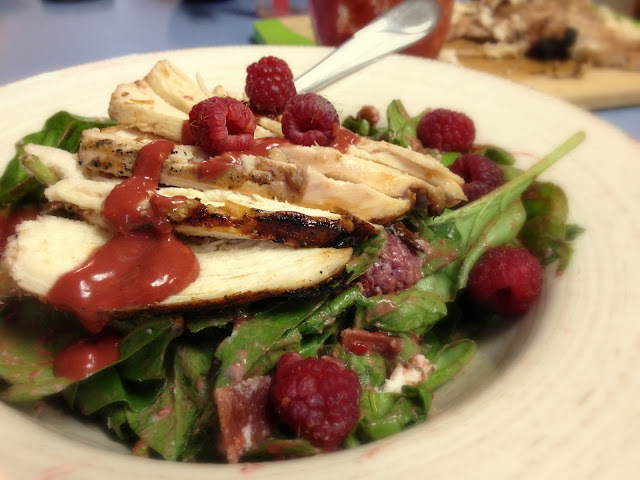 The rich combination of goat cheese, pecans and bacon topped with succulent grilled chicken was perfectly complimented by the acidic bite of the beautifully pink roasted raspberry balsamic vinaigrette. Tip: If you're tempted to skip making your own dressing in favor of a pre-made balsamic vinaigrette- don't! It only takes a few extra minutes, and it's well worth your time! Place the chicken and 1/2 cup of the dressing in a large ziploc bag and marinate at least 30 minutes or up to overnight. Heat the grill to medium heat and brush lightly with oil. Grill chicken until internal temperature reaches 170 degrees (7-8 min. per side). Meanwhile, prepare salad. Toss spinach with raspberries, bacon, goat cheese, and pecans. Dress salad now, or serve dressing on the side if you prefer. When chicken is done, slice thinly and place on top of individual servings. Preheat oven to 425. 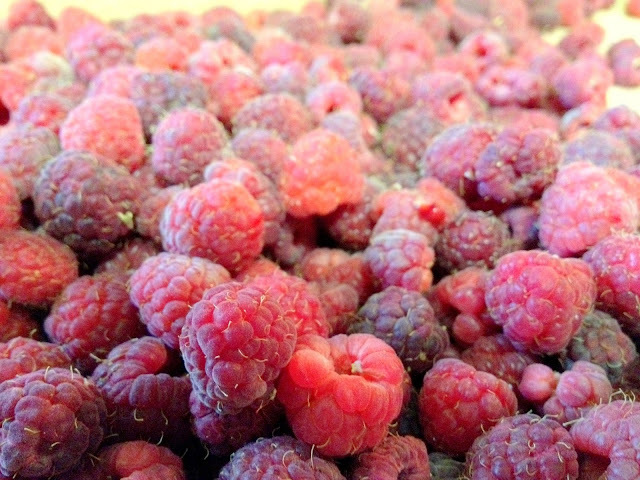 Place raspberries in a single layer on a baking sheet lined with foil and lightly greased with cooking spray. Roast about 10 min., watching carefully so as not to burn berries. Allow to cool slightly. Puree all ingredients, including roasted raspberries, in a food processor or blender until smooth, adding more oil or vinegar as needed if dressing is too thick. Store in the refrigerator. Mmm, goat cheese and raspberries. A perfect pairing! We'd love to interview you for our site, would you be interested? Let me know at laurence@gourmandize.com!